The Central Woodlands is a self-identified “community of place” comprised of the northern portion of East Central Regional Development Commission’s service area. It includes northern Mille Lacs, Kanabec and Pine Counties, and southern Aitkin County. This region is very rural, has high rates of unemployment, low incomes (75% live in poverty), and a large percentage of older adults. Thus, many of their projects focused on older adults. Someday Isle is a nonprofit shop and community economic development center on Isle’s main street, where local artists sell their wares. 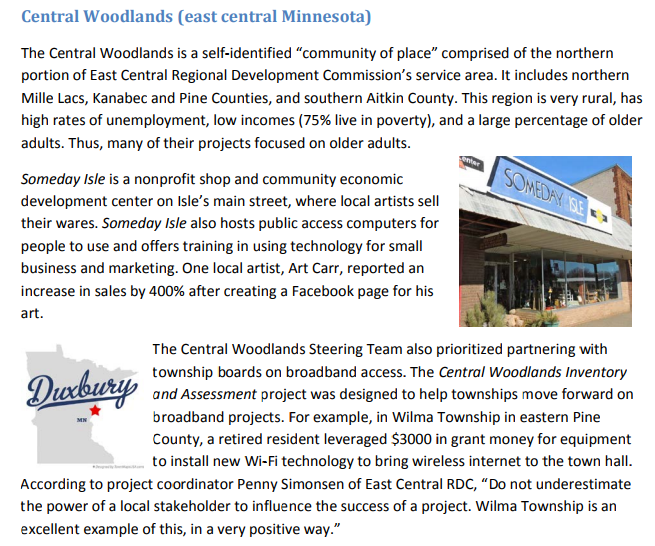 Someday Isle also hosts public access computers for people to use and offers training in using technology for small business and marketing. One local artist, Art Carr, reported an increase in sales by 400% after creating a Facebook page for his art. For a more recent look at Mille Lacs, Kanabec and Pine and Aitkin Counties – check out the county profiles I did earlier this year. This entry was posted in bbc, Blandin Foundation, MN by Ann Treacy. Bookmark the permalink.